The Marcy-Holmes Gateway is an open-air gallery displaying part of the neighborhood’s rich history. The gallery consists of 24 miniature bronze recreations of neighborhood landmarks including houses, churches, sawmills, industrial buildings, stores, apartments and geological features. Each of the stops on the Hidden in Plain Sight History Tour corresponds with one of these sculptures. 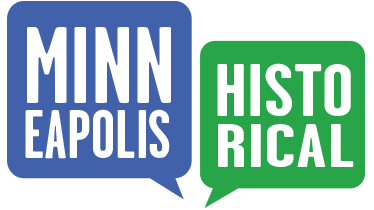 • connect this historic neighborhood with the Stone Arch Bridge and Mississippi River. They selected local artist Aldo Moroni. Moroni is best known for his fanciful, off-kilter depictions of buildings and landscapes. His past commissions have included pieces for the 9th District Federal Reserve Bank, Theatre de le Jeune Lune and the Hiawatha Light Rail Transit program. 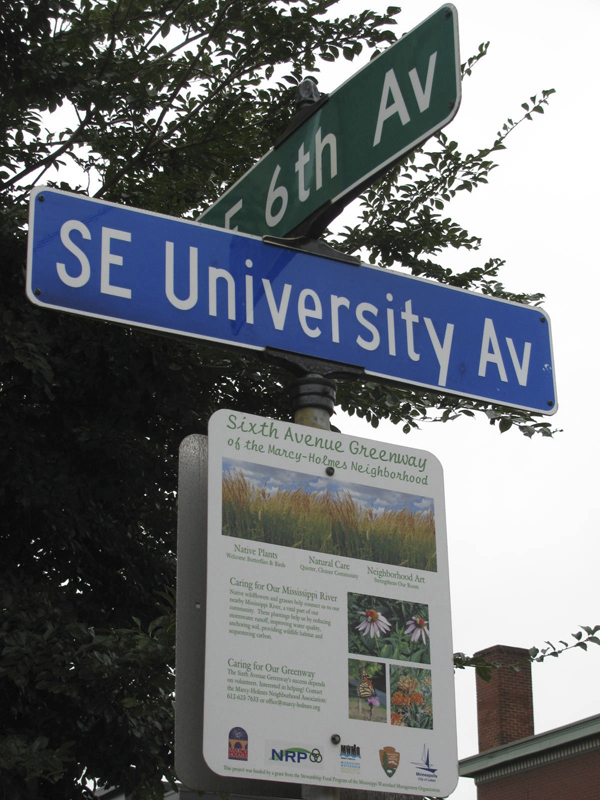 To choose the 24 landmarks included on the Greenway, Moroni worked closely with neighborhood historian, Penny Petersen, and her book, "Hiding in Plain Sight: Minneapolis’ First Neighborhood." He traveled throughout the neighborhood, parking his mobile studio for weeks at a time and carving representations of neighborhood sites in clay. 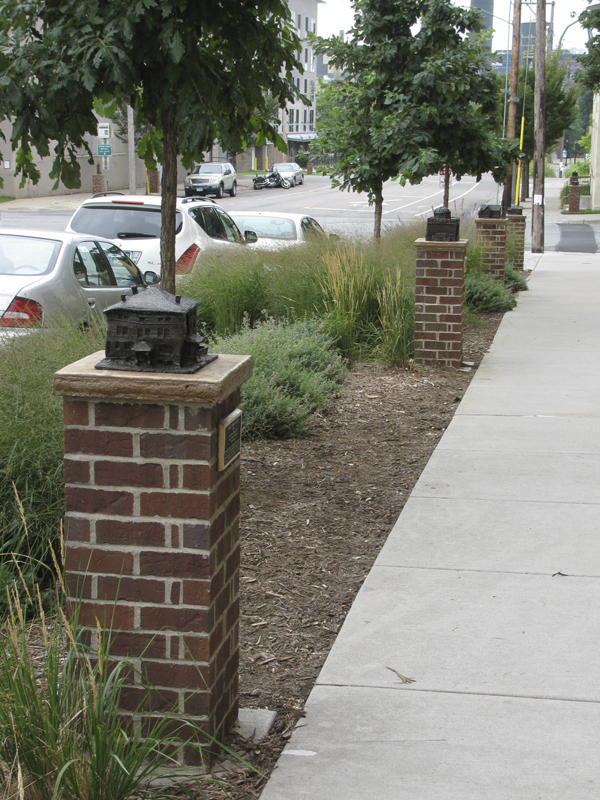 He then transformed the clay models into bronze and installed them on brick columns. Neighborhood volunteers planted native grasses and flowers around the sculptures and the gateway was christened in 2004. The Marcy-Holmes Gateway was commissioned by the City of Minneapolis Art in Public Places Program, in partnership with the Marcy-Holmes Neighborhood Revitalization Program and the Department of Public Works. Initially established by the Minneapolis Arts Commission, Art in Public Places has commissioned fifteen other neighborhood gateways throughout Minneapolis over the last fourteen years. Marcy-Holmes Neighborhood Association, “6th Ave. Gateway Sculptures,” Minneapolis Historical, accessed April 22, 2019, http://minneapolishistorical.org/items/show/74.